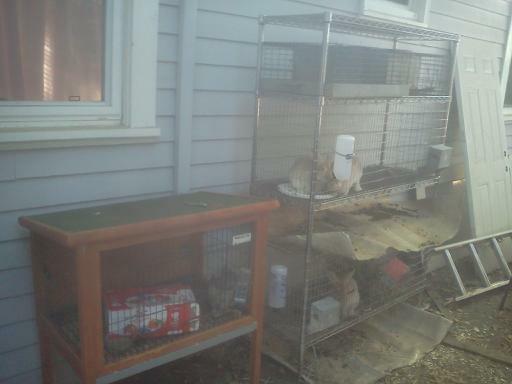 Rabbits can be housed in a variety of ways. With homemade cages or with purchased cages. There are pros and cons to each method of housing. You have to pick the method that suits you best. 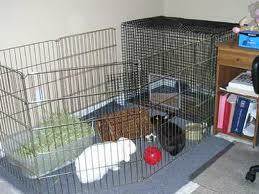 It is generally cheaper to build your own rabbit cage and people do this in a variety of manners. I've seen rabbits comfortably housed in old wooden crates tipped on the side with a front barrier made of wire and wood. I've seen rabbits housed colony style (where they all run together in a nice big pen with hidey holes, jumping platforms and what not). I've seen them in chicken hutches (using rabbit wire not chicken wire), but the most popular for indoor rabbits is doing C & C cages. Here is a post on some of the indoor housing you can make. Colony Style: can work really well. 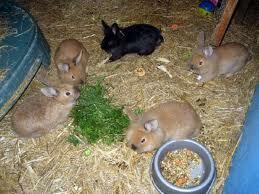 Tends to work best with rabbits introduced at a young age or raised up from babies in the colony. Can run into problems with over population quickly if you have 'entire' rabbits. Works wonderfully well with neutered/spayed animals. Allows them to interact with each other. Rabbits will generally have a potty corner. This type of housing can be done indoors or out, with or without a layer of bedding. I've seen small colonies built in housing where a family will have the rabbit room and they've made a lovely small office into a bunny living area. no bedding use except in the litter area (which was a large rubbermaid container). All the rabbits were neutered males. 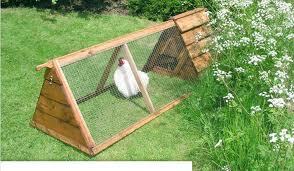 Chicken type hutches. As long as the cage is moved every single day and is tarped for the winters bitterly cold days, these hutches work well. Do use rabbit wire on them as opposed to chicken wire because rabbits can dig through chicken wire really really fast. Wire cages: these can be purchased or made to your own specification. Round top, slanted top, square top. It's all good as long as the rabbit has plenty of room. Not as suitable for indoor living unless you buy one with a tray and urine guards. Resting boards or a close watch for sore hocks is a necessity. C & C cages: these tend to be the most popular to build as they are SO easy to make with the materials inexpensive and easy to find, requiring very little in the way of tools. One sheet of coroplast, a package of zipties, and office storage cubes. A cage can be built (depending on your skill level and how fancy you are making it) in 30-60 minutes. Free range: there are folks who simply let their rabbits roam. The advantage of this is you don't have to have a cage, or if you do, just a small one for transport. Rabbits are generally easy to litter train. The more difficult part is managing your rabbit: what if it is a chewer, a digger, and such like? If your rabbit is, then helping to control it's tendencies and not ruin your house is more difficult. Best NOT to do this with an outdoor rabbit as outdoor rabbits dig, get caught by predators (hawks, rabbits, weasels, raccoons, dogs, etc), and can pick up a host of disease. and here's a novel one. :) Person had a metal shelving unit and said...hmm.. I can make a cage out of this! They got some good wire, wrapped it around well and voila...a couple of cages. :) It's not quite the way she wants it here, needs to add a poop catching tray that sit right under the cages. Here is a post that talks about different types of purchased caging. 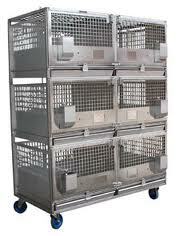 Plastic bottomed: Most purchased cages seem to be the plastic bottomed cages that you find at your local pet store. They range in size from the small hamster sized, to the larger 4 foot long cages. They can come with or without wheels, placed flat on the ground or raised up. These cages are nice to use as they keep all the litter contained. 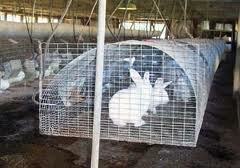 The biggest disadvantage to these cages from the rabbit's point of view is that they are slippery and can use rabbits to get splay leg or to develop other leg deformities. If you keep your rabbit in one of these, please maintain a level of bedding at least one inch deep. ALWAYS get the biggest cage you can afford or let your rabbit out of the cage as much as you can. 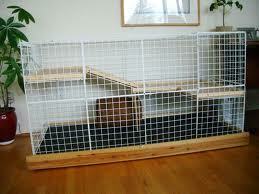 Exercise Pen: Should I ever retain a pet bunny I shall probably utilize this method of housing. Spacious, easy to open to let rabbit out to roam, easy to close to keep rabbit retained, and finding a cover for it for those jumpers can be easily made or purchased. Wooden/wire hutches: now these hutches are nice. They can come in multiple levels. Problem with wood is two fold. They can pee on it (and wood soaks up pee really really well), and if the rabbit chooses to potty on the wood section they are a pain to clean out. Wire cages: the preferred method of most (but not all breeders). Wire cages allow the feces to fall away from the rabbit ergo keeping them healthier and cleaner, less likely to pick up illness from their own feces. It's cheaper in that you don't need bedding if you clean your rabbit out daily. And they just require a weekly good soak and rinse. It is easy to provide resting boards so the rabbit can get off the wire.